Everyday life has become busier and busier over the decades, and the simple pleasures in life have slowly become squeezed out. Handmade Living is set to change all that on the 28th April 2011. Each issue will be packed with inspirational articles on craft, fashion, beauty, cookery and the garden. Added to this is a unique section on children’s crafts and activities that will enable our readers to make the most of their precious time spent with their family. There will be interviews with a whole range of people from crafters to farmers and architects who inspire us to live a slower, more fulfilling lifestyle. So if taking a step back from the hustle-bustle of everyday life is something you’d like to do then Handmade Living will fit the bill. Each issue will have inspirational features, interesting interviews, tasty recipes, gardening, travel, craft projects that encompass a range of skills and time commitments and family fun. At the heart of Handmade Living is the idea that taking time out to enjoy the simpler pleasures will enhance your life.We believe that taking the time to craft, to cook, to tend your garden – however small and to spend time with your family is important to our wellbeing. 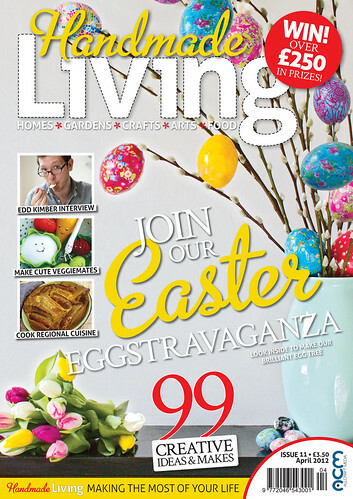 Handmade Living is a magazine that encompasses all these things and more – the range of topics that we cover allows you to pick and choose the thngs that you feel will enhance your life. At our core we value the ethos of a slow lifestyle and we appreciate that you may not have time to fulfil your dreams but will show you how to make the most of the precious time that you have.